The Athens Digital Lab welcomes eight new teams of entrepreneurs poised to develop solutions to the city’s most pressing challenges. The teams build upon Mayor Georgios Kaminis’ commitment to empower and leverage the talent of the city’s entrepreneurs. As part of the City of Athens’ Digital Roadmap, the Athens Digital Lab was launched by the City of Athens, in October 2017, to bring together entrepreneurs, government, and tech companies to collectively develop digital solutions to the city’s most pressing challenges. 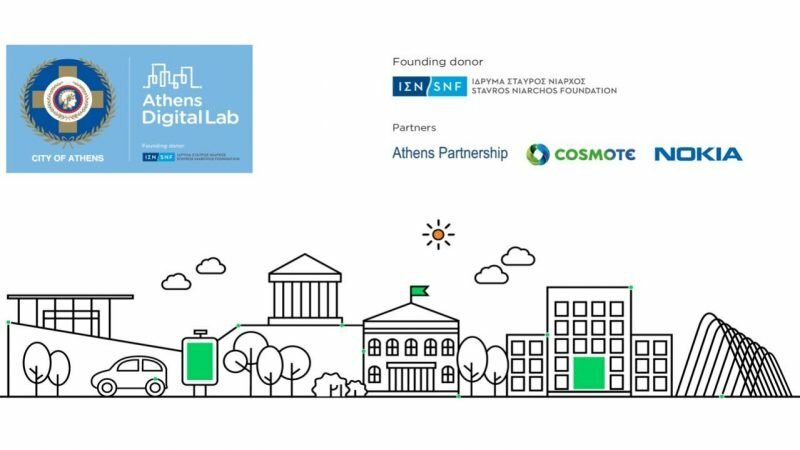 This innovative lab is funded with an exclusive grant from the Stavros Niarchos Foundation (SNF) in partnership with the Athens Partnership, and implemented with support from leading tech companies COSMOTE and Nokia. Since its launch, four digital solutions have been incubated at the Lab including the creation of a smart waste management system, a green management system, a ground-breaking data marketplace and a public space management system. Each of these solutions has been piloted by the City of Athens. ● Narratologies, IoT enabled walks, an immersive experience of myths and tales that represent the hidden imaginary of the city. ● SpaceStudents, in-class engaging game simulating a space colony, educating students to recycling and optimal use of resources and energy, highlighting the value of sustainability. More information about Athens Digital Lab and the terms of participation can be found at www.athensdigitallab.gr or on their social media pages on Facebook and Instagram.